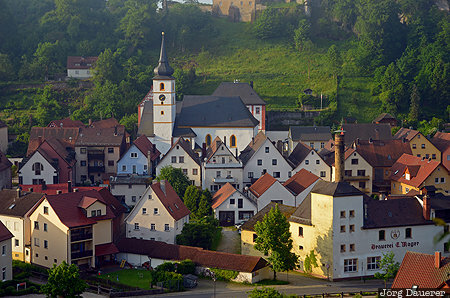 The small city of Pottenstein illuminated by warm morning light. Pottenstein is in Upper Franconia (Oberfranken) in the north of Bavaria, Germany. This photo was taken in the morning of a sunny day in June of 2013. This photo was taken with a digital camera.